Director James Ponsoldt follows up the tender and thoughtful The Spectacular Now with another intimate and insightful look at a relationship between two characters searching for a sense of meaning in one another. 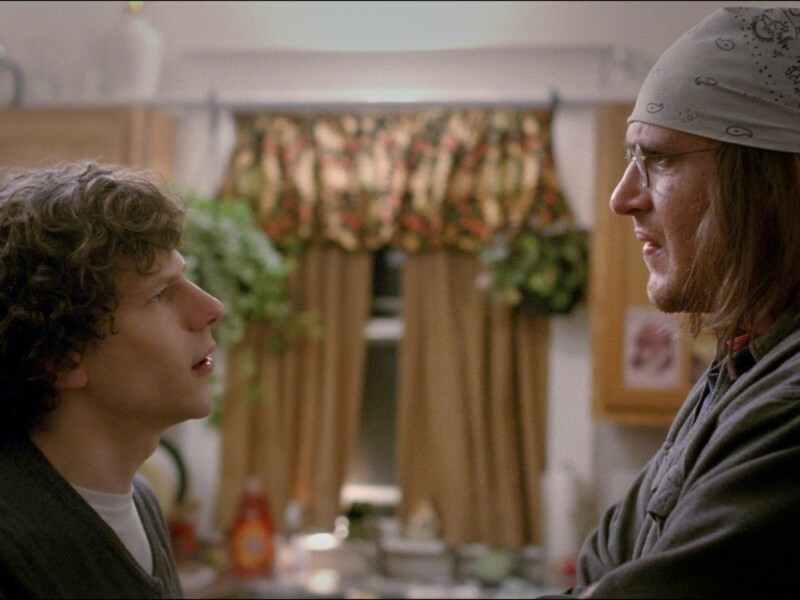 This time around, those roles are filled by Rolling Stone journalist David Lipsky (Jesse Eisenberg) and acclaimed author David Foster Wallace (Jason Segel), who tragically took his own life in the summer of 2008. Covering a five day period during Wallace’s 1996 book tour for his gargantuan novel Infinite Jest, The End of the Tour focuses on the real life encounter between the two men as they discuss a myriad range of topics including the nature of fame, the sting of loneliness and the ever elusive metric of American achievement. In this way, this film can really be thought of as one large conversation and on those terms, it succeeds quite well. The screenplay, adapted from Lipsky’s novel Although of Course You End Up Becoming Yourself, is able to draw directly from the most notable exchanges between the two without feeling like it’s ticking off boxes on a thematic checklist in the process. The dialogue between Lipsky and Wallace is appropriately brainy, as it’s meant to highlight their shared intellectual prowess, but it’s also grounded in the world of these characters and still comes off as sounding natural without being overly clever. The two lead actors also do a fantastic job of adding layers of subtlety in their performances to keep the writing fresh and to keep viewers on their toes as well. Together, Eisenberg and Segel conjure up a competitive chemistry that is never quite made explicit but rather resides as a source of underlying tension between the two characters. There’s all sorts of insecurity and bitterness that frequently threatens to crop up mid-conversation but they’re both very deft at sublimating these impulses into something more meaningful or productive instead. Lipsky and Wallace do participate in psychic and verbal sparring from time to time but ultimately, these two have quite a bit of respect and admiration built up between one another. They bond on superficial topics like fast food and popular music but they also relate on a more philosophical and spiritual level, discussing concepts of self-expression and modern entertainment with vigor and passion. Had they met under different circumstances, where the roles of interviewer and subject weren’t so clearly defined, it’s easy to imagine these two becoming close friends. Nevertheless, the journalistic perspective is always in the forefront of this film. The tape recorder that Lipsky utilizes almost serves as the primary antagonist of the film, its red eye constantly surveilling their most intimate moments of conversation. It’s made clear that both men are doing their jobs: Lipsky is trying to find any new angle on Wallace that will give him an edge and Wallace is desperately attempting to conceal his bruised ego while assuming the role of a “normal guy” who just happens to be a brilliant writer. They never stop performing for one another, which makes their talks all the more riveting to encounter for the first time.